Top: NGTS lightcurve of the flare from ULAS J2249-0112. Blue points are NGTS photometry and the best fitting model is overlaid in red. Bottom: Residuals from the model fit. Credit: Jackman et al., 2019. European astronomers have spotted a giant white-light flare on the ultracool L dwarf designated ULAS J224940.13-011236.9. The newly detected flare is one of the largest flares ever observed from an ultracool dwarf. The discovery is detailed in a paper published February 3 on the arXiv.org pre-print server. L dwarfs are variable in many ways, including periodic modulation due to clouds, radio emission due to aurora, or the presence of white-light flares. In general, white-light emission occurs through reconnection events in the stellar magnetic field, what results in heating of the lower chromosphere. Although white-light flares are regularly reported on various types of stars, they are rarely observed on L dwarfs. Notably, such events observed on L dwarfs exhibit some of the largest changes in brightness ever recorded. However, finding new white-light flares on L dwarfs is challenging as it requires long-duration observations, in particular high cadence wide-field observations targeting very faint objects. A team of astronomers led by James A. G. Jackman of University of Warwick, UK, has conducted such observations using the Next Generation Transit Survey (NGTS). The observational campaign, aimed at searching for stellar flares on low-mass stars, resulted in the detection of a white-light superflare from ULAS J224940.13-011236.9 (or ULAS J2249-0112) on August 13, 2017. The object on which this flare was spotted is an ultracool L2.5 dwarf with an effective temperature of 1,930 degrees K, about 10 times smaller than our sun, located some 248 light years away from the Earth. 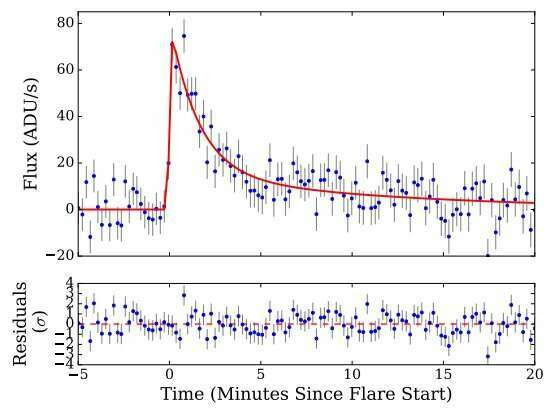 "In this letter, we present the detection of a white-light superflare from the L2.5 dwarf ULAS J224940.13-011236.9, which was observed at high cadence with the Next Generation Transit Survey (NGTS)," the researchers wrote in the paper. NGTS observations show that the flare on ULAS J2249-0112 lasted about nine and a half minutes, with a rise time of 12 seconds. The flare had an amplitude of -10 mag, a luminosity of 530 octillion erg/s and an energy of 2.3 decillion erg. The astronomers note that the newly observed flare is the second-largest flare detected from an L dwarf, and the second to be spotted from the ground. Moreover, ULAS J2249-0112 turns out to be the coolest star ever found to exhibit a white-light flare and the sixth L dwarf to have exhibited flaring activity. "With a spectral type of L2.5 we believe ULAS J2249-0112 is the coolest star to show a white-light flare to date," the scientists noted. According to the authors, the detection of such a large flare on ULAS J2249-0112 illustrates the importance of high-cadence observations with NGTS in studying the largest stellar flares from the coolest stars. "This behavior would not be visible in the TESS [NASA's Transiting Exoplanet Survey Satellite] 30-minute cadence full-frame images, nor in all-sky surveys, which monitor large areas of sky each night. This shows how NGTS is in an ideal position to probe flare behavior on the latest spectral types," the researchers concluded.